is the main protagonist in Yu-Gi-Oh! GX and the reincarnation of The Supreme King. Jaden's design incorporates multiple layers of clothing and a wide range of expressions. Depicted here is the Duelist in full Slifer Red regalia from front, side, and rear alongside views of his head from different angles. Jaden's character design was overseen by Kenichi Hara. Jaden's usual outfit consists of the standard Slifer Red uniform, unbuttoned, and a black shirt underneath. In season four, the normal Slifer Red uniform pants were replaced by jeans. A Deckbox is strapped above his waistline, largely hidden beneath the lower rim of his jacket. In the first episode he is seen wearing a high school uniform similar to the one worn by Yugi Muto, though colored black instead of blue. His brown eyes are positioned directly beneath the bangs of the layer closest to his face. He carries an Academy-issued Duel Disk on his left arm. In the fourth season, Jaden is seen with his new look, but he is still easy to identify from the past seasons. He comes back with longer hair, a longer, darker Slifer Red jacket, darker pants and, since he fused his soul with Yubel in the third season, occasionally manifesting its power to protect himself in the form of his eyes glowing the same bichromatic scheme Yubel's did. His eyes have also been slightly redesigned. 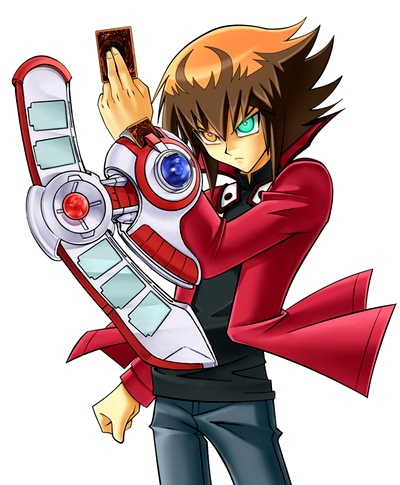 His Duel Disk now fully customized, has red outlines on it, though otherwise it looks the same (although the difference is very noticeable). In the Japanese version, Jaden rarely uses honorifics, and his speech pattern could be considered rude as a result, similar to Joey Wheeler's. In the dub, Jaden has several catchphrases associated with him. He begins almost every Duel with the phrase "Get your game on!" and often says some variation of "I'll throw down a face-down" when Settingcards. He also occasionally uses the phrase "Here goes something" when drawing in a desperate situation. Jaden tends to speak in stereotypical '90s slang, calling people "bro" and advising opponents to "chill". He is also noted for saying "A Duel's not over till the last card is played!" which is likely Jaden's way of expressing his belief in the Heart of the Cards. In the Japanese version, Judai sometimes says "Is that so?" when he is about to turn the tables and win the Duel. In both the English and Japanese versions, Jaden will wink and point two fingers at a defeated opponent. In the dub, whenever Jaden wins a Duel, he says "That's game"; in the Japanese version Judai says "Gotcha! Tanoshii dyueru dattaze" ("Gotcha! That was a fun Duel"), or simply "Gotcha!". Jaden loves Dueling and believes that all problems can ultimately be solved through it. He keeps going no matter how hard things get or how hopeless it seems, with a few exceptions (though it doesn't take much encouragement for him to start fighting again), although he does sometimes doubt himself. He always shows respect towards his opponents, with a few exceptions, even complimenting them during a Duel. Jaden shows little interest in areas outside of Dueling, which extends to his classes. When he chooses to attend them, he generally falls asleep. Despite his low grades, he is still regarded as one of Duel Academy's best Duelists. However, this attitude eventually shows itself as one of his greatest flaws, and causes him to be targeted by Mr. Stein. He shows a lack of knowledge in areas outside of Dueling, even showing in one instance that is unaware of what the term "fiancee" means, and forgetting that the holographic water will not drown him in another. He also seems ignorant of the dislike that other individuals have for him, as despite the obvious tension between the two, he considers himself to be good friends with Chazz Princeton. His carefree attitude and lack of thought get him into trouble occasionally, such as when he handed the Satellite Keys to Sartorius and still expected the latter to Duel him before using them. He occasionally shows signs of intellect, such as determining that Titan's Shadow Game was a fake. One of Jaden's common traits is that he tends to make jokes or puns, even in some situations where it is not appropriate. Most of the jokes he makes are Duel-related but on a few occasions he does make jokes at someone's expense. For example, he called Crowler "Cyclops" when the latter got struck in the eye with a tennis ball. Jaden has a close bond with his cards, to the point where he has no problem with an opponent insulting him, but is angered when they insult his cards. Jaden is also fiercely loyal to his friends, which often results in his risking his life to save them. This is ultimately exploited by Yubel and Brron, who drive him to the brink of despair via the elimination of his loved ones, which weakens him enough to be possessed by the spirit of his past life. After being freed from the influence of The Supreme King, Jaden shows many signs of depression, and constantly asks himself where he went wrong, and is horrified by what he's done while ruling the alternate dimension. Even after the sacrifice of Aster Phoenix, Jaden is still unable to regain his resolve. When confronted by Guardian Baou, Jaden even resigns himself to be killed at the same spot his friends were sacrificed. His resolve is stirred by the arrival of Bastion Misawa, who reveals that Yubel is responsible for everything that's transpired. Wanting revenge, Jaden defeats Baou and moves on, witnessing what he believed to be the death of Zane Truesdale, which stirs him to continue. After his ordeal in season three, Jaden develops a much more cynical outlook on life and is far more brooding and serious. He finds himself unable to enjoy Dueling and attempts to end his Duels as quickly as possible. He even ceases to use his catchphrases. Despite still caring deeply for his friends, he is much more distant towards them, not wanting them to be hurt by the danger his presence tends to attract. He begins to recover his love of Dueling during the Pair Duel tournament and fully recovers it during his Duel against Yugi. This is proven in Yu-Gi-Oh! 3D Bonds Beyond Time. Even when Jaden was still fused with Yubel and The Supreme King, he showed the same personality when he was in the first three seasons, showing that he in fact loves Dueling again. Jaden demonstrated incredible athletic abilities, seen when he jumped into the air at a great height to hit a tennis ball served by Mindy. After he fused Yubel's soul with his own, his athletic ability has shown to have increased. He was seen jumping on platforms while trying to escape from an exploding KaibaCorp building, as well as jumping from building to building when he was attacked by Paradox. Jaden has had an ability called the The Gentle Darkness inside his soul, which gives him the power to see and hear Duel Monster spirits and control them. This is the main power that is used by the Supreme King. In the fourth season, Jaden can use it to materialize Duel Monsters and their powers. After the events in the Dimension World arc, Jaden now has the power of Yubel inside him. When he materializes his Duel Monsters, he can make them even stronger. Yubel's power allows him to sense people's thoughts and emotions, see visions of the future, and makes him immune to hypnosis. The word "Judai" means "teenager", while "Yuki" has multiple meanings, the most common being "Courage"; thus it can be inferred into the phrase "Courageous Teenager". 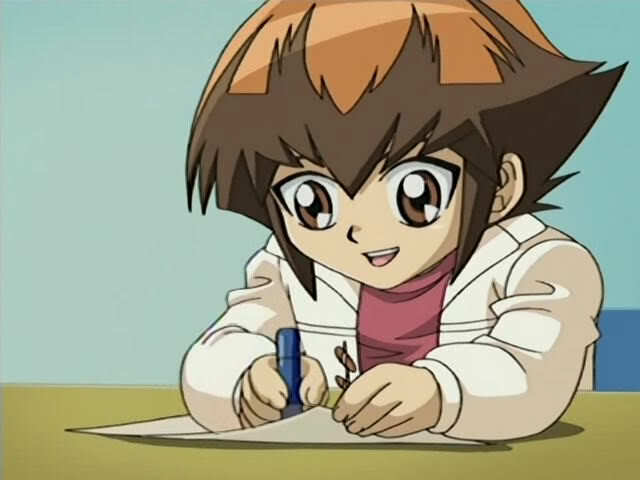 Jaden as a child, drawing his card designs for KaibaCorp's contest. As a child, Jaden loved Duel Monsters. His favorite card was "Yubel", which was a gift from his father. Both his parents were rarely at home, as they were busy working. As a result, Jaden spent many of his days playing Duel Monsters with neighborhood children. However, whenever Jaden played "Yubel", something horrible would happen to his opponent. One of them,Osamu, fell into a coma. The spirit of the "Yubel" card was overly protective of Jaden, and punished his opponents. After that incident, no one wished to Duel Jaden, as they feared for their safety. Around this time, Jaden entered a card design contest held by KaibaCorp, and won with his monster designs, which included the "Neo-Spacians" and "Dandylion". As part of the project, the cards he designed were launched into space, with the hopes that the cards would be imbued with space waves. Jaden requested that his "Yubel" card be sent up in a separate capsule, in the hopes that the space waves would pacify the malicious spirit of the card. Soon after, Jaden began having nightmares, where he would see Yubel burning in flames. Worried, his parents arranged for him to have a medical procedure performed on him, which rendered his memories of Yubel dormant. Jaden meets Yugi and receives "Winged Kuriboh". Jaden overslept on the morning that he is scheduled to take his entrance exam in order to enroll in The Academy. As he rushed through the streets to make it to the test center in time, he bumped into Yugi Muto, dropping his cards in the process. Yugi asked Jaden if he was a Duelist and gave him a "Winged Kuriboh" card, telling Jaden that he felt that "the card belongs with him". When he arrived, the head teacher at Duel Academy, Dr. Crowler, was hesitant to allow Jaden to take his exam, but a phone call from his superior,Chancellor Sheppard changed his mind. Crowler Dueled Jaden himself, and disregarded the rule that he is to use an exam Deck, instead using his personal Deck. Jaden is impressed by Crowler's "Ancient Gear Golem", but is able to hold off its attack with "Winged Kuriboh", whose spirit he is capable of seeing and communicating with, something that most people would not be able to do. He proceeds to win the Duel using "Elemental Hero Flame Wingman" and "Skyscraper", with him citing the former as his favorite card. Jaden is accepted into Duel Academy and is placed in the Slifer Red dorm, which is the lowest-ranked of the three dorms. Jaden's roommates were Syrus Truesdale and Chumley Huffington. Jaden would then get himself in a confrontation with Chazz Princeton, an Obelisk Blue student who had witnessed Jaden's defeat of Crowler. Believing his victory to be a fluke, Chazz challenged Jaden to a Duel, which is interrupted midway through. Though Chazz believed he would have won, Jaden had just drawn a card that would win him the Duel. Dr. Crowler, eager to exact his revenge on Jaden, began plans to get him expelled. He placed a fake love note in Jaden's gym locker, on which he had forged the signature of Alexis Rhodes, one of the top female students. Syrus found the note instead of Jaden, and rowed across the lake to the girls dorm. Jaden followed and saved Syrus from expulsion by defeating Alexis in a Duel. The owner of Duel Academy's card shop, Ms. Dorothy, gifted Jaden with some rare cards after he helped her push her van up the hill when it stalled. In Duel Academy's promotion exams, Jaden had his rematch with Chazz, who had been supplied powerful cards by Dr. Crowler. Jaden's use of "Transcendent Wings" to evolveWinged Kuriboh to level ten won him the Duel, and he is therefore allowed to move up to the Ra Yellow dorm. He declined the opportunity. Crowler's crusade against Jaden continued, with him sending Titan, a self-proclaimed "Shadow Duelist" to defeat Jaden. Titan used illusions to make it appear he had the ability to start Shadow Duels. Jaden was skeptical throughout the whole Duel, and is proven correct - it was a sham. They Duel in the Abandoned Dorm, and the spirits of the dorm are angered by Titan. A real Shadow Duel actually did begin - with Jaden still refusing to believe in it until the Duel's end, when he is saved by Winged Kuriboh. Due to their trespass at the Abandoned Dorm, both Jaden and Syrus were nearly expelled. They got a chance to stay by participating in a Tag Duel. Should they win, their records would be cleared. Jaden Dueled Syrus as practice for the latter, and Jaden defeated him. Finding that Syrus had confidence problems, he is then told by Alexis that they stem from Syrus' relationship with his older brother, Zane, who is known as the best Duelist at the academy. Determined to help Syrus and to see how he ranks against the best, Jaden challenged Zane to a Duel. Though the latter compliments Jaden's abilities, Jaden suffers his first loss since arriving at the academy, losing to Zane's "Cyber End Dragon". Despite this, it is enough to spur Syrus' confidence. The two were unable to function as a team in their Duel against the Paradox Brothers at first, but pulled things together in the end, allowing them to stay at the academy. Jaden developed a friendship and rivalry with Bastion Misawa. Both had expressed desire to Duel one another since witnessing their respective entrance exams. Crowler wished to secretly use Bastion as his next weapon against Jaden, after both Chazz and the Paradox Brothers failed. Wishing to promote Bastion to Obelisk Blue, Crowler set up a Duel between Bastion and Chazz. Despite Bastion's victory, he declined entry into Obelisk Blue, stating he will not enter it until he becomes the best student in the freshman class. To do so, he believes he needs to defeat Jaden. However, he does not wish to Duel him right away, as he wished to develop a Deck specifically to counter Jaden's. As a result of Bastion's victory, Chazz departed Duel Academy rather than be demoted to Yellow. Jaden stayed at Duel Academy during winter break, finding himself in a life-threatening Duel with the spirit of the "Jinzo" card. Jaden felt real pain as his Life Points decreaseed, and his body parts fade as he is attacked. Though he wins, he gets his first taste of a Shadow Duel, though he does not realize this until a later date. Jaden then found himself in a Duel over the affections of Alexis against the captain of Duel Academy's tennis team, Harrington Rosewood. Harrington gets an early lead during the Duel with his "Ace" cards. After Jaden deals major damage to him via direct attacks, he then activates "Deuce" and almost wins with its effect, but Jaden was able to save himself. Jaden won the Duel by getting through Harrington's almost unstoppable defensive combo through "Feather Shot", becoming Alexis' fiancee as per the terms that Harrington set. However, he has no clue what fiancee means. Alexis calls him an idiot in response (in the English version, she tells that it means they're just friends, "for now"). Jaden got an opportunity to Duel against the Deck of Yugi Muto when said Deck went on tour at Duel Academy. A copycat Duelist named Dimitri stole the Deck and Jaden Dueled him to get it back. He found himself in awe of Yugi's monsters, and was excited when he defeated "Dark Magician" with "Elemental Hero Bladedge". However, Dimitri Summoned "Dark Magician of Chaos", which devastates Jaden. He hung on, and successfully defeated Dimitri with "Flame Wingman", recovering the Deck. Jaden is nominated by Zane to be the academy's representative against North Academy, with Chancellor Sheppard accepting it. Crowler nominated Bastion in turn, and proposed the two of them Duel in order to decide who the representative would be. Bastion claims that he's nearly finished his Deck that will counter Jaden's strategy. Jaden gained an early advantage in the Duel, but is set back when Bastion negated "Polymerization" with "Cursed Seal of the Forbidden Spell", preventing Jaden fromFusion Summoning in the usual way. Jaden is forced to play defensively as Bastion's "Water Dragon" and "Hyozanryu" destroyed his monsters. Jaden unveiled a new "Elemental Hero" - "Wildheart". Using it and and "Cyclone Boomerang", Jaden won the Duel via Effect damage. Bastion then promised to create another Deck to challenge Jaden again someday. Jaden found his rivalry with Chazz renewed when the latter returned to Duel Academy as the representative of North Academy. Jaden overheard an outburst of Chazz's, in which he expressed dislike for the burden his brothers put on him to win. Chazz unveils new "Armed Dragon" cards which prove to be more effective against Jaden than his previous Decks had been. Jaden is surprised to discover that Chazz has gained a Spirit Partner in Ojama Yellow and that Chazz can see Duel Spirits as well. Jaden won using a strategy involving "Hero Kid". Chazz's brothers berate him after the Duel, and Jaden steps in to defend him. Chazz decided to remain at Duel Academy afterward. The Slifer Red dorm head and alchemy professor, Lyman Banner, held a hike and picnic to the ruins that exist on the island. Jaden, Syrus, Chumley and Alexis attended. While there, they appear to be transported to the past, to a time when the ruins were still in use. Jaden's friends were captured, but Jaden himself is saved by Yasmin. He eventually ends up in a Duel against Gravekeeper's Chief, in which he and his friends will be buried alive if he loses. He found that the pain he experiences from losing Life Points to be real. Jaden narrowly defeated the Chief by using the effect of his "Elemental Hero Necroshade" to Summon "Elemetnal Hero Bladedge". The Chief gifted Jaden with one half of a Shadow Charm pendent after the Duel, stating that it should help protect him in any furtherShadow Duels he may participate in. The group is returned to their own time. Chancellor Sheppard selected Jaden as one of the seven Duelists to hold the Spirit Keys. These keys unseal theSpirit Gates, behind which the Sacred Beast cards are sealed. The legend goes that if the cards are released, a catastrophe will occur. A group of individuals known as the Shadow Riders will arrive and attempt to steal the keys. Jaden believed he'll be targeted first, believing himself to be the strongest target. Alexis also believed Jaden will be first, as his Slifer Red uniform marks him as a weaker Duelist. In attempting to warn Jaden of this, she is transported to the volcano with Jaden, where the first Shadow Rider, Nightshroud, awaits. As it turns out, he targeted Jaden for neither of the previously given reasons - he did so because he owns the other half of the Shadow Charm pendent, which pointed him in Jaden's direction. Syrus and Chumley are taken hostage, so Jaden accepted the Shadow Duel, in which the loser's soul will be sealed in a card. Nightshroud gained an early advantage by combining "Red-Eyes Black Dragon" and "Inferno Fire Blast". Jaden made a comeback, but Nightshroud unveils "Red-Eyes Darkness Dragon". Jaden narrowly avoided defeat by Summoning "Elemental Hero Wildedge". Nightshroud's soul was sealed in the card, but he remains barely conscious, as Nightshroud was controlling someone else - the brother of Alexis, Atticus. Left weak from his Duel with Nightshroud, Jaden watched from the sidelines as Dr. Crowler is defeated by the second Shadow Rider, the vampire known as Camula, having his soul sealed in a doll in the process. When Camula insulted Crowler's Dueling skills, Jaden defended him, saying that he knows Crowler isn't weak as he's Dueled him himself. This spurred Crowler to continue, but he ultimately fell before Camula. Zane meets the same fate when Camula threatens Syrus' soul. Enraged by the fall of his friends, Jaden challenged Camula after Atticus informed him that his complete Shadow Charm may be able to negate the power of Camula's and prevent souls from being stolen during the Duel. This turned out to be true, as Camula is forced to use her own soul as a cost in theactivation of "Illusion Gate", rather than a spectator's as she had against Zane. Jaden was able to defeat her with "Elemental Hero Shining Flare Wingman", who gains ATK for each fallen "Elemental Hero" in the Graveyard. With this, Camula's soul was taken by "Illusion Gate" and the souls of Crowler and Zane were restored. Jaden began having nightmares regarding losing Shadow Duels, knowing that great harm could come to his friends. While trying to relax at the hot springs, he, Syrus, Chumley and Chazz are pulled through a portal to an underground cave. They are confronted by Kaibaman, causing Jaden to question if the latter is a Shadow Rider. He refused to answer, instead wishing to Duel, stating that Jaden seemed to have lost his fighting spirit. Kaibaman used the same Deck as Seto Kaiba, and Jaden is ultimately defeated. However, he realized that he still had fun during the Duel and Kaibaman taught him that if he is scared of defeat, he will cease to grow as a Duelist. Jaden is present when Bastion is defeated by the third Shadow Rider, Tania, who takes him as her "husband" afterwards. Jaden overcame her "Amazoness" monsters using "Wildheart" and the effect of her own Field Spell Card, Amazoness Arena". Jaden ends up mistaking a submarine captain named Admiral for the next Shadow Rider and though Jaden defeats him, Admiral kidnapped him, hoping to make him the top student at his planned underwater Duel Academy. Jaden stole an escape boat in order to get away, but did not make it back to Duel Academy until three days later. Jaden's next opponent was Abidos the Third, an ancient pharaoh revived by the Shadow Riders who was once known as the "God of Duels". Jaden defeated him with fewer problems than expected, and Abidos realized that his servants had always let him win. Abidos is impressed by Jaden's Dueling and returns to the afterlife, with Jaden promising to meet him there when he dies so that they can Duel again. Alexis and Chazz successfully defeated Shadow Riders Titan and Don Zaloog, respectively. This left only one Shadow Rider remaining. During this time, Professor Banner disappeared, and both Chazz and Alexis are defeated by the final Shadow Rider. Jaden confronts him in the basement of the Abandoned Dorm. He eventually revealed himself as Professor Banner. He stated that Jaden must prove himself as the "ultimate alchemist", comparing Jaden's process of using "Polymerization" to fuse monsters to be similar to alchemic processes. Banner explained that he came down with an illness after traveling the world in the name of alchemy, and was forced to entrust his soul to a homunculusin order to survive. Wishing to pay back the one who funded his research, he aimed to obtain the Sacred Beasts. Banner is eventually defeated when Jaden countered the latter's removed from play strategy with "Elemental Hero Electrum". Banner left his Emerald Tablet Shadow Charm to Jaden, warning him of the impending disaster that the Sacred Beasts will bring about. After Chazz's Duel against Alexis, Jaden witnessed the Spirit Gates open, without the aide of the Spirit Keys, which Chazz currently had. The keys led them to the gates, at which point the keys disappeared into the seven pillars surrounding the area. The ground quaked, and a black box rose from the center of the gates, inside of which was a smaller, box that contains the Sacred Beasts. The true mastermind of the ploy revealed himself - Kagemaru, the elderly Chairman of Duel Academy. He intends to use the powers of the Beasts to restore his own youth. He specifically challenged Jaden to a Duel in favor of rest of the gathered students and teachers. Jaden found "Sabatiel, the Philosopher's Stone" inside the Emerald Tablet, and places it in his Deck. From within a life support tube supported by a spider-walker, Kagemaru Duels Jaden. Kagemaru Summoned "Uria, Lord of Searing Flames" and "Hamon, Lord of Striking Thunder", which drove Jaden into a corner. With two Beasts present, they beain to absorb energy from card spirits around the world, which was then used to restore Kagemaru's youth. He appears a young man once more, and continued the Duel. Using a series of Spell and Trap Cards, Jaden destroyed both of the Beasts with "Elemental Hero Neo Bubbleman". Kagemaru was able to revive them, however, and further Summoned the third Beast - "Raviel, Lord of Phantasms". Jaden used the "Sabatiel the philosopher's stone" card to his advantage, and was able to pentuple the ATK of "Electrum" to win the Duel. The power absorbed is returned to the Duel Spirits, and Kagemaru became eldery once more. He begged for forgiveness, and Jaden easily gave it to him, while motivating him to try to stand on his own. Jaden proceeded to accidentally injure the old man with a hug. Jaden was present at Chumley's Duel with Dr. Crowler, and supported his friend before he departed to become a card designer for Industrial Illusions. Jaden is then chosen by Zane to be the latter's final opponent before his graduation, in a match that the whole school will attend. Jaden accepted the Duel. Knowing that Zane was a powerful opponent, Jaden attempted to think his way through the Duel, which backfired as he misplayed his cards and failed to enjoy himself as he usually would.. Zane gains an advantage by constantly fusing and splitting his "Cyber End Dragon". Zane snapped Jaden out of his rut, and the latter began to Duel with his heart once more, rather than his head. In this way, Jaden became the opponent that Zane had wanted him to be. Both Duelists were able to counter the strategies of the other, and Duel ultimately ends in a draw as the crowd applauds the spectacle. During the second year, Jaden meets Tyranno Hassleberry and ventures into Neo Space after being defeated in his second Duel with Aster Phoenix. There, he learns of the ongoing battle between the forces of darkness and light. With the help of the "Neo-Spacians", Jaden adopts the role of the universe's defender wielding the "darkness of justice" against Sartorius and the Society of Light. The task of rescuing most of his converted friends from the organization's clutches also falls on him. Jaden as he appears in seasons one to three. To prevent his evil side from activating the satellite of Misgarth, Sartoriusentrusts Jaden with one of the keys to its control switch. The diviner's evil personality sends numerous Duelists after the boy to win it back, but to no avail. He ultimately confronts Jaden himself, demanding the key in exchange for Aster, from whom he had already regained the other key in battle. Jaden agreed, and although Aster was rescued shortly thereafter, both keys were put into the possession of Prince Ojin, who went on to fire the satellite. It is, however, destroyed during the course of their Duel. Sartorius is then defeated, and The Light of Destruction purged from his body. 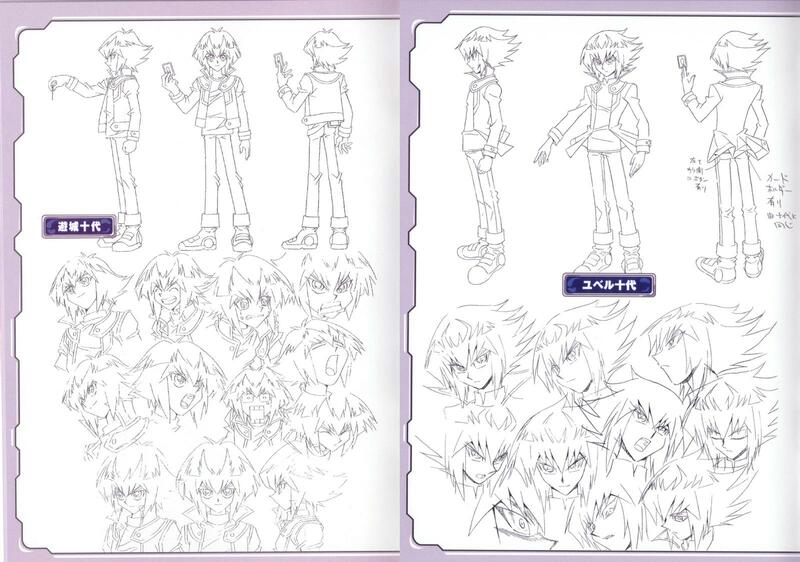 During the third year, Jaden is pursued by the spirit of his favorite card in childhood, Yubel, which was given to him by his father (in both versions he doesn't remember who Yubel is until it reveals its physical form). With his parents always working and away from home, Jaden turned to Dueling friends to pass the time, but the sadness associated with his inability to play "Yubel" properly led the Duel Monster to hospitalize a young Duelist namedOsamu and scare away the rest of his companions with other misfortunes. During this time, he develops a close friendship with North Academychampion Jesse Anderson, as the two found they had much in common. Duel Academy is transported to an alternate dimension where Duel Monsters can take physical form, and Jesse ultimately appears to sacrifice himself to grant the rest of the school passage back to their own world. Depressed at the loss of Jesse, and blaming himself for it Jaden willingly attempts to go back to the alternate dimension, taking a group of his insistent friends with him, though the end up in another, desperate dimension. However, Jaden's guilt for Jesse's situation soon leads to an obsession. He begins to think only of finding and saving Jesse and begins to disregard what his actions may make befall his other friends. Because of this, his friends Alexis Rhodes, Tyranno Hassleberry, Chazz and Atticus Rhodes all get captured and sacrificed by Brron, Mad King of Dark World in order to create the "Super Polymerization" card. When Jaden finally wins against Brron, Syrus, Axel Brodie and Jim Crocodile Cook arrive. Witnessing the others being sacrificed because of Jaden's obsession to rescue Jesse causes them to abandon him, leaving him alone. Jaden as the The Supreme King in the Dimension World. Afterwards, Jaden feels guilty at himself for allowing the sacrifices to happen. A strange figure called The Supreme King enters, influencing Jaden to become evil and saying he will never be able to redeem himself for his actions. With all his friends gone, Jaden accepts it along with the incomplete "Super Polymerization" card and at that time, The Supreme King possesses him. While under The Supreme King's control, he commits many atrocities that include unrepentant slaughter of Duelists in order to complete the "Super Polymerization" and the oppression of several villages. However, as The Supreme King performs these actions, Jaden himself is left in doubt about what he needs in order to be complete not only as a Duelist, but as a person. Unfortunately, he turns to The Supreme King for this advice, who only tells him that one can only overcome evil by becoming evil. After Axel uses Jim's Eye of Orichalcum on The Supreme King during a successful invasion of The Supreme King's castle, Jaden is freed from his possession, but is deeply tormented by the atrocities he committed during his possession, and he thus starts refusing to use his Fusion Monsters, as "Polymerization" and other cards that include Fusion Summoning remind him of the things he did while possessed, since The Supreme King mainly used fusion monsters. When Jaden starts doubting himself even more, Jesse reappears, though he is possessed by Yubel. Then learning that his friend is being controlled, Jaden puts his problems aside for the time being so that he can save Jesse. 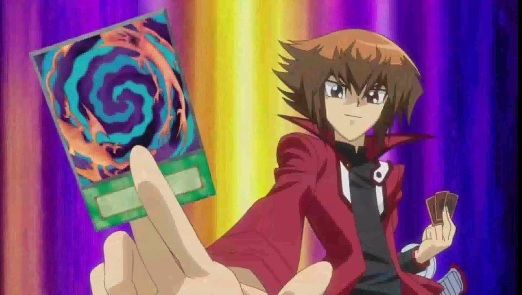 However, when Jaden finally Duels Yubel to save Jesse, it is revealed that Yubel actually removed Jesse's soul from his body and placed him inside the "Rainbow Dark Dragon" before taking over. Jaden manages to exorcise Yubel out of Jesse, but in one foul swoop, it snatches the "Super Polymerization" card from Jaden and then forces him into a Duel. Before the final clash, Jaden finds out that Yubel's power was previously augmented by the Light of Destruction while it was still stranded in space. Although he feels guilty because his actions led to Yubel's exposure, the sheer atrocity and shamelessness of its actions prevents Jaden from feeling any sympathy towards the deranged spirit. However, near the end of the Duel, Jaden is told the truth between his connections with Yubel: Instead of just being a part of him, Jaden is The Supreme King, the reincarnation of a young prince of an unknown kingdom from long ago, who was once friends with a human Yubel. As The Supreme King contained the enigmatic power of a being called the Supreme King that is needed to defeat the Light of Destruction, he needed a guardian to protect him until he was old enough to control and wisely use his power; Yubel chose herself for the role, and was transformed into the Duel Monsters it eventually became, its effect allowing for the perfect defense against anyone who tried to harm Jaden. Despite the great burden and sacrifice, Supreme King Jaden promised to give his love only to Yubel, which explained why Yubel became present-day Jaden's favorite card as a kid, and why Yubel was so obsessed and jealous with him and his friends. Finally realizing the truth behind all his troubles, Jaden - after bidding adieu to his friends - allowed Yubel to gain a hold of "Super Polymerization", chaining "Spiritual Fusion" to choose their souls as the fusion materials instead of all twelve dimensions as Yubel was expecting, and purging Yubel of the Light of Destruction's influence. Vowing to never stop loving, Yubel, they are bound together for all time. After Jaden's disappearance and everyone else being returned back to Duel Academy, Syrus, Hassleberry, Atticus, Chazz and Alexis were talking about Jaden. 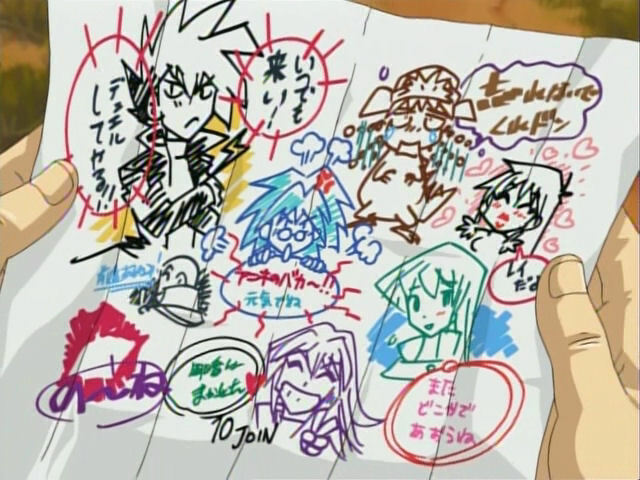 After the talk, Syrus sees a shooting star and wishes Jaden to be back, which happened as the "star" crashed at Duel Academy, and was revealed that it was Jaden, with the abilities of both The Supreme King and Yubel under his control. 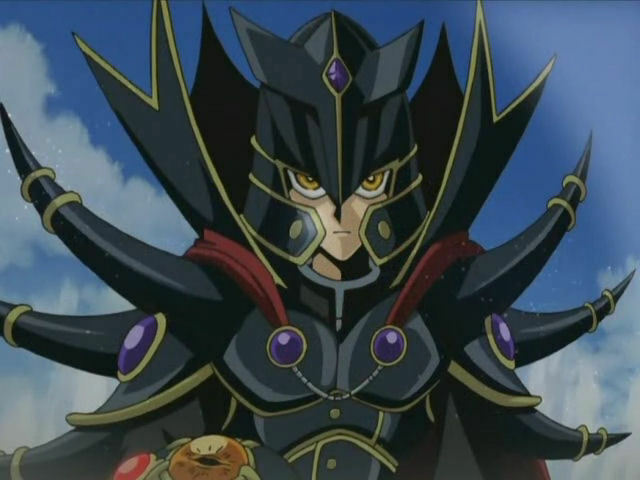 Jaden as he appears in season four, with Yubel's eyes. Jaden decides to leave Duel Academy, not wishing to put his friends in danger (he had come to believe that things that put his friends in danger happened because him being around). However, both Sartorius and Kagemaru attempt to convince him otherwise, believing that he is needed on the island to prevent a growing danger in the near future. This seems to be well-advised, as before their meeting, Jaden already confronts a mysterious Obelisk Blue student by name of Yusuke Fujiwara, who can hypnotize people and set fires with his eyes, as well as the mysterious entity Trueman, who seems to want both Jaden and Fujiwara dead. Both of these entities noticed Jaden showing Yubel's power and commented that he is not a regular human, or is not completely human. 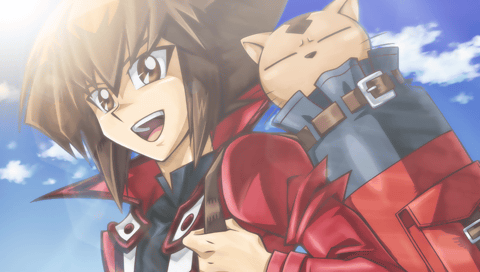 Being the last student in the Slifer Red Dorm, Jaden eventually regained his love for Dueling while teaming with Alexis in a Tag Duel. Eventually, Jaden learns that the person that everyone thought was Fujiwara was actually the spirit of one of his cards, Honest, and that Fujiwara doesn't even appear to be on earth. Although Jaden doesn't know what Trueman's intentions are, he has found that the enigmatic dark entity pulls people into the world of Darkness. He realizes this too late, having been distracted by Trueman's actions in Domino City, thus giving the real Nightshroud, using Yusuke Fujiwara's body as a vessel, to attack the students at Duel Academy, only arriving in time to see Nightshroud possessed Fujiwara defeat the last student, Atticus Rhodes. Along the way, Jaden meets Jesse in Domino City, but mistakes him for Trueman after Sartorius infected his Polymerization card. After a Duel they fail to finish, Jaden realises it is Jesse and not Trueman he's Dueling and the two of them return to Duel Academy together. Both are then challenged to a triple Duel with Nightshroud, with only Jaden remaining the winner after he purges Nightshroud from Fujiwara. However, Jaden Duels the bodiless Nightshroud in a final Duel with the world at stake. The Duel was intense straight from the start; with Jaden summoning "Neos Wiseman" using "Yubel". Jaden finally defeats Nightshroud by summoning "Elemental Hero Divine Neos" to defeat Nightshroud's "Darkness Neosphere". The letter Pharaoh had for Jaden. After the graduation ceremony, Jaden decides to leave Duel Academy quietly; however, he is brought to the room that contains Yugi's Deck by Winged Kuriboh. Yugi appears there, and after the Winged Kuriboh card glows with a bright light, Jaden finds himself in Domino City in the past, bumping into a younger Yugi who still holds the Millennium Puzzle. He challenges his hero to a Duel, and as he shuffles the Deck he senses the presence of the Egyptian Godsin Yugi's Deck. The Duel then begins, with Yugi eventually summoning "Dark Magician" and Jaden Summoning "Elemental Hero Neos", their ace monsters, which battle it out. After a long battle, Yami Yugi finally takes over Yugi's body and welcomes Jaden, and Summons "Slifer the Sky Dragon". Jaden's face lights up, and he finally realizes Dueling really is fun. He then sends "Elemental Hero Neos" to attack "Slifer The Sky Dragon" and the Duel comes to an abrupt end with Jaden, Yami and Yugi all smiling. It then pans to Jaden in a desert. Jaden then turns around and looks at the sky, and thanks Yugi for reminding him that he has a long way to go, and Dueling is fun, and shouts his very last "Gotcha!" towards the sun. His bag rustles, and he opens it to find Pharaoh and Banner inside. Inside Pharaoh's collar he finds a letter from his friends each with their own message for him. After reading it, Jaden, Banner, Pharaoh, and presumptuously Yubel decide to travel together, and thus Jaden runs off towards the sunset, off to start a new adventure. Jaden is known to have traveled to Venice in Yu-Gi-Oh! 3D Bonds Beyond Time before being attacked by Paradox. He is relentlessly attacked further by "Cyber End Dragon", "Rainbow Dragon" and "Stardust Dragon" and despite the extra protection offered from Summoning "Elemental Hero Neos", he was nearly overwhelmed by all their attacks. He only survives due to the intervention of Yusei Fudo and the Crimson Dragon, the latter of which takes the final blows for him. He then explains to Yusei about Paradox's plan to eliminate Maximillion Pegasus and destroy time itself. They then use the Crimson Dragon to travel back to the days of Yugi Muto, only to find they were too late to stop Paradox from killing Pegasus. They return thirty minutes earlier after recruiting Yugi to their cause, with Yubel scaring off the patrons just before Paradox would appear to Duel them. Jaden activating"Polymerization" in the English trailer of Yu-Gi-Oh! 3D Bonds Beyond Time. Though only having one turn in the Duel, Jaden shows his mastery of fusion as he Summons a new Fusion monster, "Elemental Hero Neos Knight", by fusing his "Neos" with Yusei's "Junk Gardna" and destroying Paradox's "Malefic Cyber End Dragon" and "Malefic Rainbow Dragon". He shows his characteristic excitement when seeing Yusei's Duel Runner during their first meeting and when Yusei Synchro Summons "Junk Gardna" during his first turn. He and Yami Yugi also manage to convince Yusei not to forfeit after he loses faith in their victory after the Summoning of "Malefic Truth Dragon". He and Yami Yugi are able to give "Stardust Dragon" the power to defeat "Malefic Truth Dragon" and defeat Paradox. Following their victory, all the damage Paradox caused to the timeline is repaired and the three return to their respective timelines with Yusei promising to protect the future and meet him and Yugi again. Syrus and Jaden first met at the entrance exam and later they became best friends at Duel Academy. Syrus looks up to Jaden as a "big brother", resulting in a rivalry with Tyranno Hassleberry. Jaden believes in Syrus even when he lacks confidence in himself. Alexis Rhodes has always shown interest in Jaden and his Dueling skills. Along the series they have become very close friends, willing to support each other in the most difficult times. Jaden has admired her since the first time they Dueled, and he's grateful to have met her too. Alexis has seen Jaden like a friend since they met, but this changes in episode 162 when she realizes she fell in love with him. They share a lot in common, like the same passion for Dueling. Though originally Jaden's main rival, Chazz eventually becomes a close friend. Jaden considered them to be friends much earlier than Chazz did. Though their rivalry continues, they form a bond to their shared battles in various arcs. Chazz is even willing to accompany Jaden into the other dimensions to help find Jesse, but still maintains that the two are not friends. Blair originally had a crush on Zane, but her fixation shifted to Jaden after being defeated by him. When Jesse first came to Duel Academy, Jaden was fast friends with him because of how they were able to communicate Duel Spirits. Jaden cares for Jesse up to the point that Jaden got upset that Jesse was left behind in the Spirit World when Duel Academy returned to its home dimension. Yubel was the spirit of a card Jaden owned in his youth. Due to a promise made to Jaden's past life, Yubel protects him at any cost, putting several of his opponents into comas. Jaden's past life held romantic feelings for Yubel and pledged his love to her and her alone (all aspects of this are removed in the dub). She returns to seek out Jaden years later, wishing for him to make due on his past life's promise at any cost (in the dub, she wants revenge for being sent away). Every action she takes is to get closer to Jaden and believes that everything she does is out of love, no matter how heinous the action. Jaden eventually accepts her feelings and fuses himself with her via "Super Polymerization". Main article: Jaden Yuki (manga)Jaden in the manga. Jaden Yuki is a headstrong student at Duel Academy who aspires to be as great aDuelist as his mentor, Koyo Hibiki. Jaden in the ending ofYu-Gi-Oh! GX Tag Force 3. In Yu-Gi-Oh! GX Tag Force, Jaden can be selected as a partner. Upon maximizing all his hearts, he gives the player with a "Miracle Fusion" card. He partners with Chazzduring the Tag Force tournament if not partnered with the player. During part three, he is brainwashed by Amnael and will Duel the player and their partner alongside theShadow Rider. He is returned to normal upon defeating him. Jaden uses an "Elemental Hero" Deck, which focuses on Warrior-Type monsters themed after superheroes. The majority of Jaden's "Elemental Hero" monsters lack power, but he supports them with a variety of Spell and Trap Cards to unleash effective combos. Jaden relies largely on Fusion, as almost all of the "Elemental Heroes" introduced in the anime can fuse with each other, giving Jaden's Deck many options in almost any situation. He further relies on recycling "Polymerization" to his hand and reviving or retrieving "Elemental Hero" monsters from the Graveyard. Jaden's trademark "Elemental Hero" is "Elemental Hero Flame Wingman", which can be further fused into "Elemental Hero Shining Flare Wingman". In his second year, after his second Duel with Aster, Jaden's Deck is left blank to his eyes due to Sartorius' powers. With the inability to use his old "Hero" Deck, Jaden received a new one that included the "Neo-Spacians", cards he created as a child for a KaibaCorp contest. The highlight of Jaden's new Deck is "Elemental Hero Neos", which can initiate Contact Fusion with the "Neo-Spacians" to summon Fusion Monsters without the need for "Polymerization". Jaden also includes support for the "Neo-Spacians" and "Neos", such as "Neo Space", to prevent the new fusions he Summons from returning to the Fusion Deck at the End Phase through their effects. He combines this Deck with his old one. While under the control of The Supreme King, Jaden used an "Evil Hero" Deck, consisting of more powerful, sinister Fiend-Type incarnations of his trademark heroes, such as "Evil Hero Inferno Wing" to "Flame Wingman", Summoned through the usage of "Dark Fusion". Compared to Jaden's normal Deck which relies on combos and often chance of the draw, his "Evil HERO" Deck relies on the brute force supplied by his monsters, which are immune to Spell and Trap cards when Summoned by "Dark Fusion". Jaden also uses "Super Polymerization" to use his opponent's monsters as Fusion Materials. In the manga, Jaden uses a different set of "Elemental Hero" monsters, that are seemingly nature-based, which he had inherited from Koyo Hibiki. His iconic card here is "Elemental Hero Terra Firma". He later switches to the "Masked Hero" cards. ↑ 1.0 1.1 Yu-Gi-Oh! GX Episode 1: "The Next King of Games"
↑ 2.0 2.1 Yu-Gi-Oh! GX Episode 2: "Welcome to Duel Academy"
↑ 3.0 3.1 Yu-Gi-Oh! GX Episode 12: "Formula for Success"
↑ 4.0 4.1 Yu-Gi-Oh! GX Episode 21: "The Duel Off, Part 1"
↑ 5.0 5.1 Yu-Gi-Oh! GX Episode 36: "Duel Distractions, Part 1"
↑ Yu-Gi-Oh! GX Episode 17: "Nature of the Draw"
↑ Yu-Gi-Oh! GX Episode 44: "The Seventh Shadow Rider"
↑ 8.0 8.1 8.2 8.3 Yu-Gi-Oh! GX Episode 131: "All for One"
↑ Yu-Gi-Oh! GX Episode 62: "A Greater Porpoise"
↑ Yu-Gi-Oh! GX Episode 153: "Return of the Supreme King, Part 1"
↑ Yu-Gi-Oh! GX Episode 3: "A Duel In Love"
↑ Yu-Gi-Oh! GX Episode 4: "Raring To Go"
↑ Yu-Gi-Oh! GX Episode 5: "The Shadow Duelist, Part 1"
↑ Yu-Gi-Oh! GX Episode 6: "The Shadow Duelist, Part 2"
↑ Yu-Gi-Oh! GX Episode 7: "Duel and Unusual Punishment"
↑ Yu-Gi-Oh! GX Episode 8: "For the Sake of Syrus"
↑ Yu-Gi-Oh! GX Episode 10: "Tag Team Trial, Part 1"
↑ Yu-Gi-Oh! GX Episode 11: "Tag Team Trial, Part 2"
↑ Yu-Gi-Oh! GX Episode 14: "A Spirit Summoned"
↑ 20.0 20.1 Yu-Gi-Oh! GX Episode 29: "Doomsday Duel, Part 1"
↑ Yu-Gi-Oh! GX Episode 15: "Courting Alexis"
↑ Yu-Gi-Oh! GX Episode 22: "The Duel Off, Part 2"
↑ Yu-Gi-Oh! GX Episode 25: "The School Duel, Part 1"
↑ Yu-Gi-Oh! GX Episode 26: "The School Duel, Part 2"
↑ Yu-Gi-Oh! GX Episode 27: "Grave Risk, Part 1"
↑ Yu-Gi-Oh! GX Episode 28: "Grave Risk, Part 2". ↑ Yu-Gi-Oh! GX Episode 30: "Doomsday Duel, Part 2"
↑ Yu-Gi-Oh! GX Episode 31: "Field of Screams, Part 1"
↑ Yu-Gi-Oh! GX Episode 32: "Field of Screams, Part 2"
↑ Yu-Gi-Oh! GX Episode 33: "Field of Screams, Part 3"
↑ Yu-Gi-Oh! GX Episode 37: "Duel Distractions, Part 2"
↑ Yu-Gi-Oh! GX Episode 38: "Get Yarr Game On!" ↑ Yu-Gi-Oh! GX Episode 41: "A Reason to Win"
↑ Yu-Gi-Oh! GX Episode 45: "Amnael's Endgame, Part 1"
↑ Yu-Gi-Oh! GX Episode 46: "Amnael's Endgame, Part 2"
↑ Yu-Gi-Oh! GX Episode 48: "Rise of the Sacred Beasts, Part 1"
↑ Yu-Gi-Oh! GX Episode 50: "Magna Chum Laude"
↑ Yu-Gi-Oh! GX Episode 51: "The Graduation Match, Part 1"
↑ Yu-Gi-Oh! GX Episode 162: "Judai VS Asuka: Face-down card of Hidden Emotions"
↑ Yu-Gi-Oh! GX Episode 20: "The Maiden in Love"
↑ Yu-Gi-Oh! GX Episode 155: "Return of the Supreme King, Part 3"